Homes for Sale in Corrales, NM currently start at asking prices from below $200,000 up to $2+ million. About 10 Luxury Homes (around $1 million to $2+ million) are listed. There is also plenty of land available. At this time there are about 70 vacant land listings ranging between $75,000 for a 0.87 Acre parcel up to $1,350,000 for a 6.21 Acre plot of land. Please use the search below to view all listed Homes for Sale in Corrales, NM and contact us to request a private showing for any properties you would like to view. Corrales, NM is nestled on the western bank of the Rio Grande and is a true New Mexican Village. Just minutes north of Albuquerque, this hidden gem offers residents and visitors alike a glimpse into the past with its restored hacienda and historic mission church. 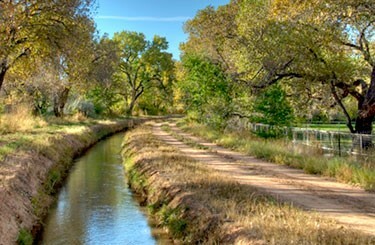 Its beautiful acequia (ditch bank) trails provide walking, jogging, biking and horse-riding paths among treasured cottonwood trees. Visit unique shops, fine restaurants and wineries. Stay in a B&B that evokes a genuine sense of place, attend a concert, and visit art galleries. Corrales is close to everything, yet far away in spirit from the big city. It is an oasis. To find details about the Village of Corrales visit www.corrales-nm.org and http://www.visitcorrales.com. Corrales Harvest Festival will be held on September 30th and October 1st. Corrales Holiday Art Fest will be held on December 2-3. Corrales Art Studio Tour will be held on May 6-7th. July 4th Parade will be held on July 4th. The Village of Coralles was selected as #19 in CNN Money’s list of the 100 best places to live in 2007.